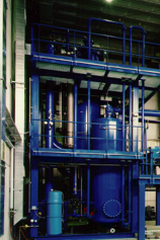 ProCone GmbH, during the last 25 years, has developed a special and patented process for the gasification of carbon-containing (organic) solids. 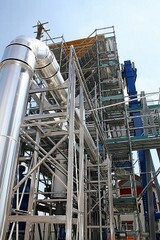 At the end of the development the BASURA-Multiwaste©-Gasifier stands as the centerpiece of this gas-generation technology, the BASURAgas® Universal System, which is suitable to produce synthesis gas from, per example, renewable biomass, waste collections of all kinds and sources of coal. ProCone recognized very early that the centerpiece of this gas generator, the gasifier, is not only suitable for generating energy, but also for the simple conversion of chemically complex molecular compounds, which allow direct recycling of problematic waste materials. The special property of the carbon element, namely the reaction to most chemical compounds with oxygen, is used to withdraw the oxygen atoms contained in the feedstock materials from the chemical compounds. Using the element iron as an example, this can be represented very well. As in conventional incinerators, all possible substances are oxidized, iron is converted into the corrosion product iron oxide, also known as rust, which is no longer suitable for further material use and therefore usually has to be landfilled. In the reducing process of the gas generator, however, the oxygen is removed from the iron, iron becomes steel. This special property of the carbon atom is used for the actual production of steel from iron for over 200 years. The problems of waste management has advanced from an uncontrolled landfill to a controlled landfill, and with the new landfill ban in force in Europe, to the incineration technology as the current situation. In all these mentioned strategies, however, the sole purpose is to recycle expensive and scarce raw materials and to bring them in a chemical form which can be landfilled risk-free. All these methods are therefore mainly end-of-pipe solutions. Gas generating by means of pyrolysis and gasification strategically targets the reintroducing of all useful materials, chemical elements or compounds into the production process and to capture the energy contained in the materials supplied to the gas generator. 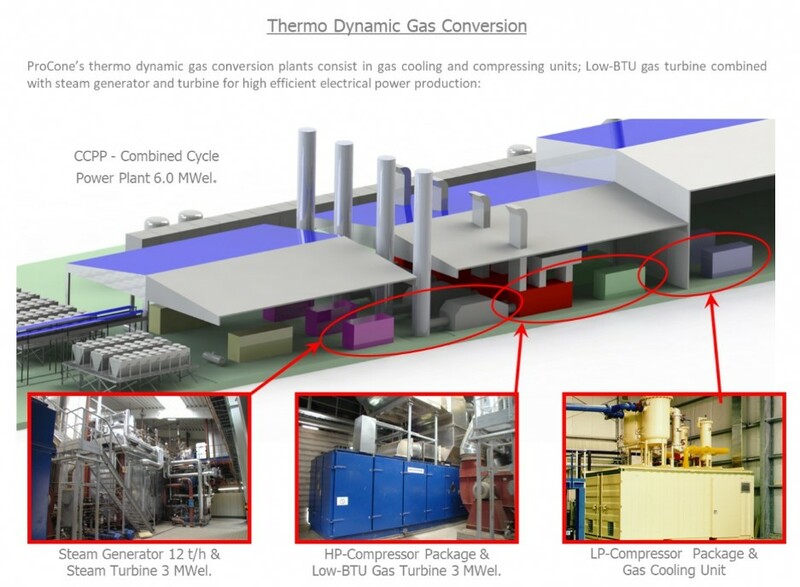 The gas generator, as the center piece of the process is serving as an actual recycle machine which is the basis of the strategy enabling a true recycling economy. Maximum harvesting of all recyclable materials and energy with ProCone’s handling & materials management supported by ProCone’s innovative technology.